China on Thursday urged all parties in Egypt to exercise restraint and resolve their differences through dialogue even as a month-long emergency has been imposed by the interim government. “China is paying close attention to the situation in Egypt, and is deeply concerned about its development,” said Foreign Ministry spokesman Hong Lei on Thursday. Lei was commenting on the Egyptian police’s decision to clear protest camps in Cairo, where supporters of ousted Egyptian President Mohamed Morsi had gathered. The dispersal resulted in clashes that have left at least 525 people dead, including 43 policemen, and more than 3,700 injured across Egypt, according to Egypt’s Health Ministry. 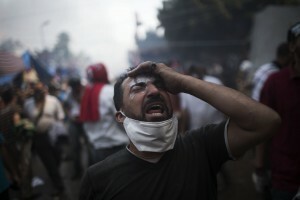 The official figures are contested by the Morsi supporters who say the death toll has reached more than 2000. Police took full control of the Rabaa al-Adawiya protest camp by Wednesday afternoon, according to the state news agency. Mick Deane, a cameraman for the UK-based Sky News channel, and Habiba Abd Elaziz, a reporter for the UAE-based Xpress newspaper, died from bullet wounds. Lei said China hoped all parties would put the interests of the country and people first and exercise restraint to avoid more casualties. He called on all sides to resolve their differences through dialogue and to restore order and social stability. South Africa has also come out with a strong condemnation of “the use of violence against demonstrators in Egypt leading to loss of life”. “We call on authorities to exercise restraint,” Clayson Monyela, a foreign ministry spokesperson in Pretoria, said on Wednesday. Monyela also said that the African Union suspension of Egypt following the coup is not yet overturned. Russia has also urged Egyptians to uphold their national interests and to exercise restraint. “In the difficult period Egypt is experiencing, we reconfirm our urge to all political forces in that friendly country to exercise restraint and moderation and to be guided by supreme national interests,” the Russian Foreign Ministry said in a statement.